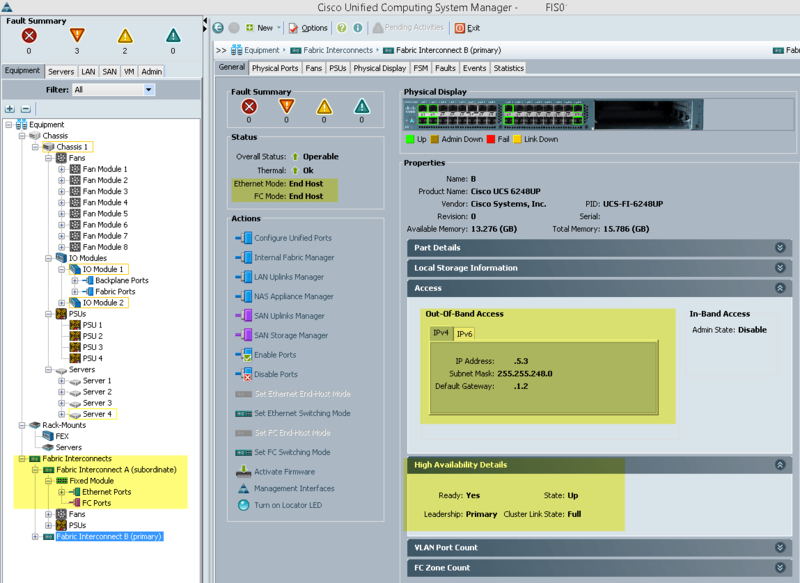 First off, huge thanks to the following posts by Rene Van Den Bedem and his Cisco UCS installation guide. My aim here is not to rip off his posts, but to detail the process myself and use my own screenshots, as along the way, the setup was slightly different to Rene’s, such as the configuration needed for the SD Cards, and the lack of boot from SAN configuration. Over all, we will be using the existing networking in place, which is made up of HP Procurve devices. A quick diagram to show how the devices were all connected up, the connections between the FI and the Chassis are coloured differently to define the overlapping cables in the diagram, and do not indicate any special separate configuration. For the LAN switch connections, if you have a single stacked switch, then try to cable so that redundant connections are across different switches in stack. If you have two separate switches (switch stacks) then you should connect a FI per switch (switch stack). 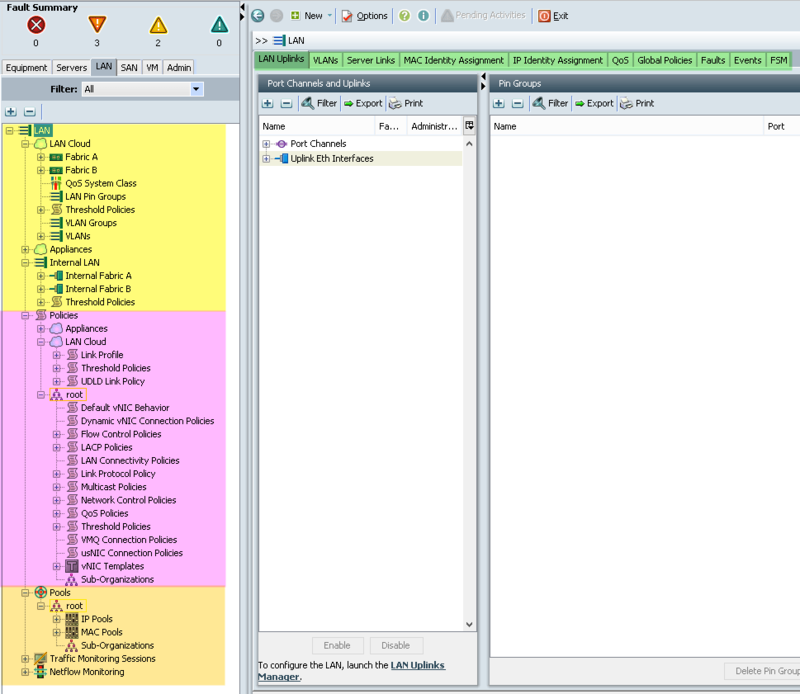 A management machine which has Java and Flash installed. The reason why Cisco UCS is so different to traditional hardware deployments is due to the upfront policy based management nature. You set all your policies first, such as QOS, created your ID pools, for things such as IP addresses, iSCSI IQNs, WWNN, Mac Addresses and so forth. You create your virtual network interfaces that will be available on the blade servers, and which networks they can contact via the Fabric Interconnects. 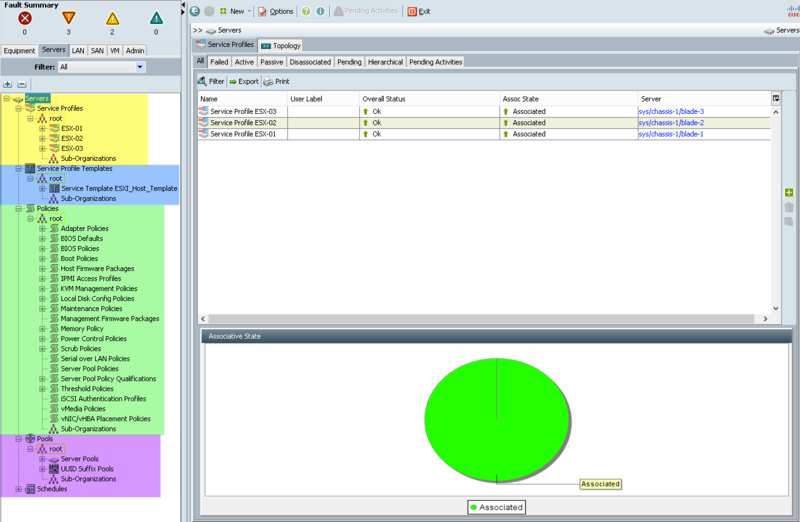 Once done, you create Service Profiles which consist of the various policies you require, I.e policies specific for an ESXi install. You deploy this profile, and associate your various hardware against the profile. Should a blade server die, you can simply replace the hardware, and not have to think about the reconfiguration needed to get it working, as all the hardware identifiers and policies will remain and be applied. Power on what will be Fabric A, but leave Fabric B turned off. 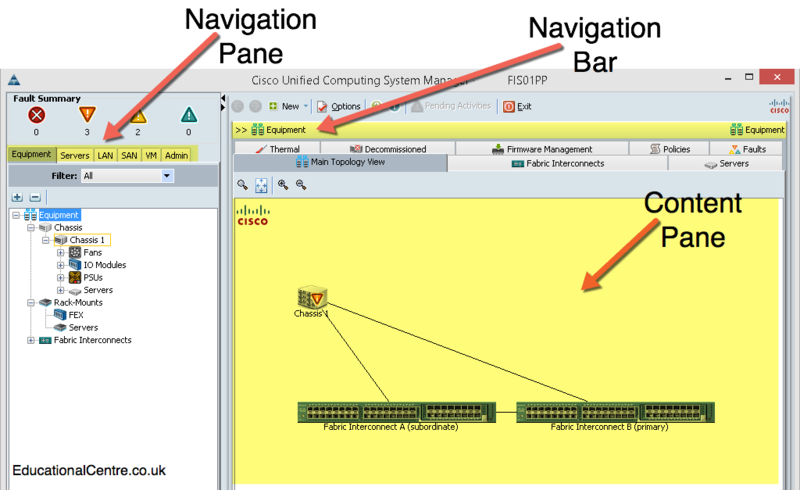 Connect to the fabric interconnect using serial cable, and the usual Cisco switch settings (9600 baud, everything else should be the same if you are using putty). Verify you can ping the Fabric Interconnect from your LAN. Once done, confirm you can ping the IP address of Fabric B.
Click Launch UCS Manager, and then provide the credentials for the “Admin” account. 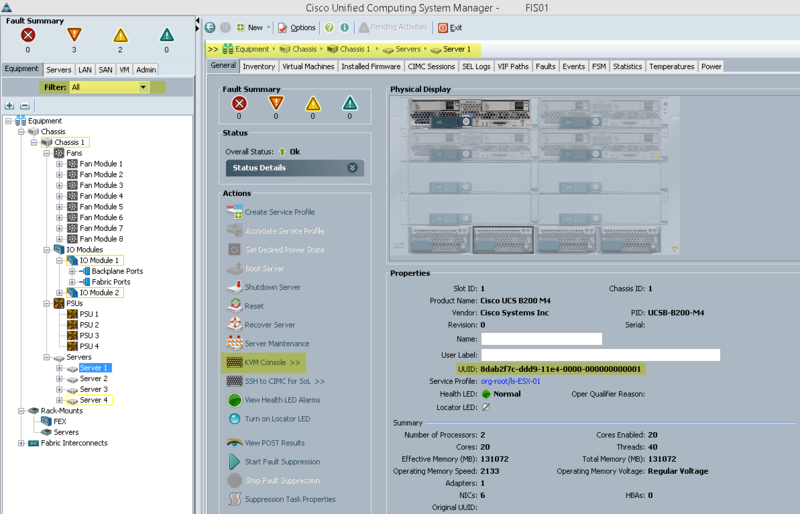 and Viola, the UCS Manager interface is ready, well once you acknowledge the chassis and blade servers, see the second screenshot. 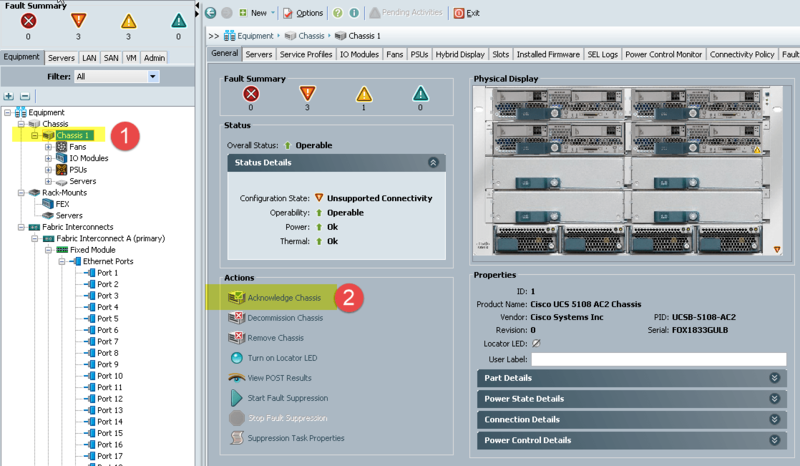 Equipment; is a hierarchical list that shows chassis (1 to 40) and Fabric Interconnects (A + B), further subcomponents such as nodes (blades or rack servers) and interface cards can be delved into further. When an object is highlighted, the attributes are shown in the content pane (right hand side). The navigation pane has a selection menu which can be used to show all objects available, or restrict the objects in view. I’ve highlighted some area’s of interest, such as remote KVM to a blade, the switching mode of the FIs, and so forth. Servers; contains all server related components, for example, service profiles, policies and pools. 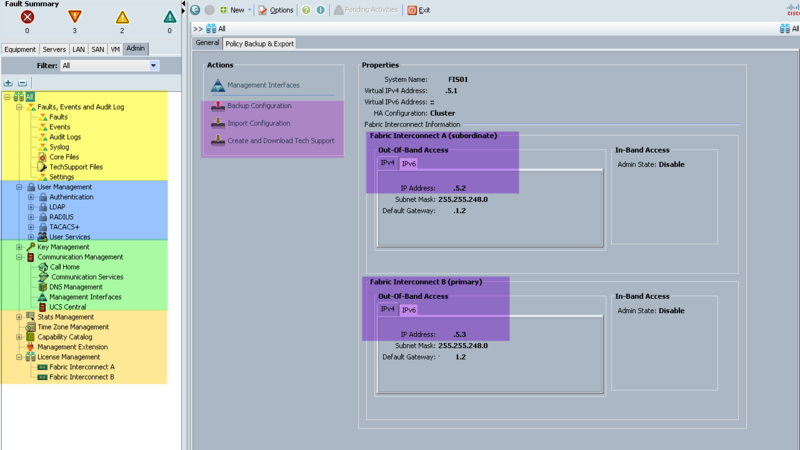 Here you can configure Organisations, Service Profiles and templates, pools and policies. LAN; contains all LAN configurations; pin groups, QoS, VLANs, policies surrounding the network configuration, pools (IP, MAC, IQN). 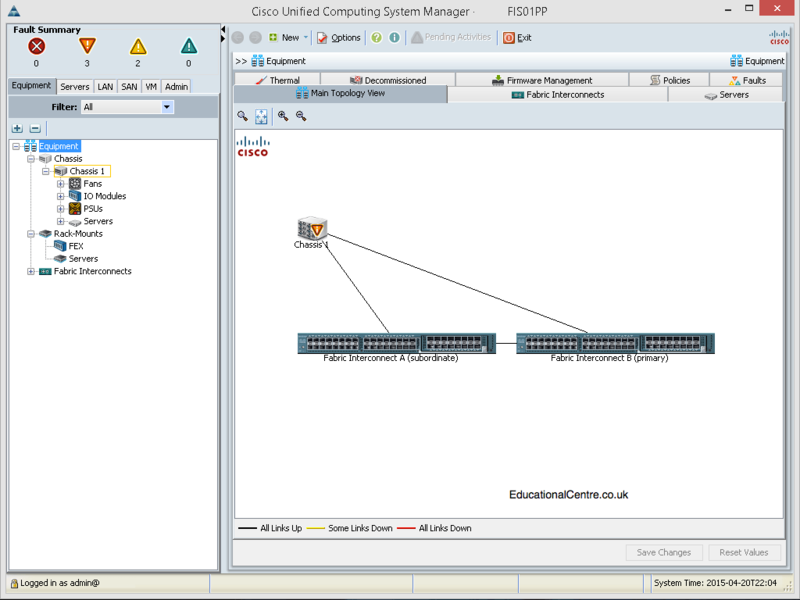 SAN; Storage area network configurations; pin groups, VSANs, policies, and pools. I’ve tried to split up the different Area’s of configuration under each tab, as I’ve not used the SAN configuration parts for my setup, there is little to show, however see Rene’s post for a more in-depth view. VM; contains all the configurations needed for VM-FEX hardware switching, which can be used on servers that have a VIC card installed. 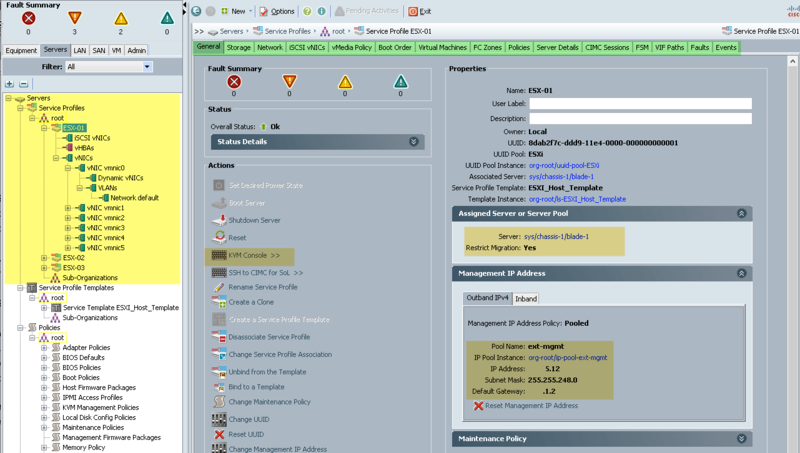 Here you configure a connection to the VMware vCenter server, and then configure Distributed Virtual Switches, port profiles and be able to view the VMs that run on each UCS Server. 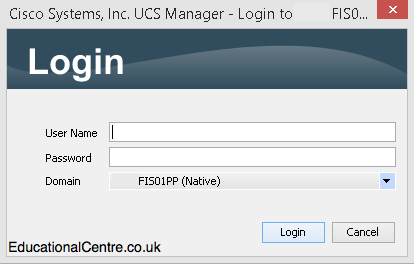 Admin; UCS System-wide settings are found here, setting up user access, LDAP Authentication, Email Alerts and so forth. So this concludes the first post, next up in part 2 we will be creating the networking for the chassis and then creating service profiles to give our blade servers and identity. Great write up, keep up the good work! I’ll look at resizing a few of the really small ones, however if I post them at full size, they are too big and make the pages unappealing to most visitors unfortunately. I do agree that larger pictures would be nice. I had to click to open each one to see what was going on. Hi, I will be reviewing the content in the posts as there are a few changes to be made, so I’ll look at picture sizing, as I’m getting feedback about both ways for the image sizes at the moment, some would like them bigger, some like them the way they are. This a typo? Didn’t recognize the model number and couldn’t find it on Cisco site (6248 for example exists). Thanks Dean, we are looking at deploying UCS next year on top of our HP networking stack also so this will prove very useful for us. Hi, this is really great to hear, thanks for the comment, I hope all goes well for your install. This is great. I’ve been hearing about UCS but never really got it. This documentation style is perfect for my mindset as I can read and see it as if I were doing it myself. I used the 2.2.4b version as it is the closest to what is in place at work. 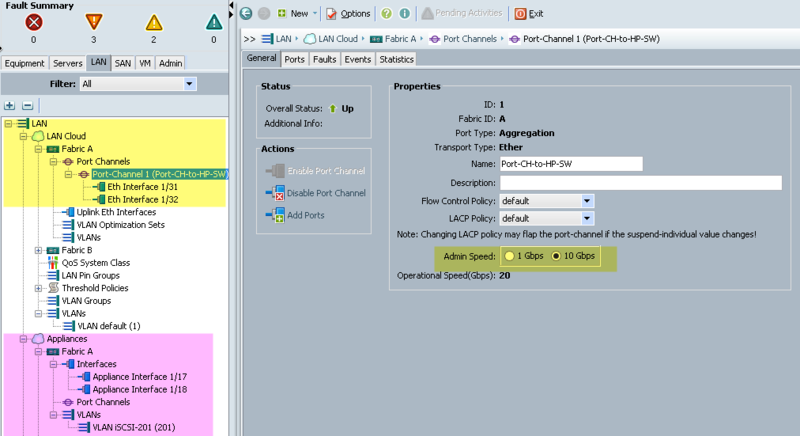 The only thing that didn’t work was as I created the VLANs, they weren’t appears under the VLAN section of the FI, even though I had them selected for both. Good guide. Id recommend doing the firmware before you install esx though. Some blades need an update to support certain versions of esxi. Good point, I’d already wrote the first three parts as they were, then the part 4 came right at the last minute, hence the order, but I’ll drop in a note on part 3! That was really a very good write up.! You spend quite some time to write it up. If possible can also mention about the Fabric Interconnect modes I mean End-Host mode & Switch mode configurations ? I may write something up as a separate post, then reply back here so you get notified, or you could subscribe to my blog. Have to say, really impressed with the content , thank you for taking the time to put it together.